Map you experiments. Gather multiple approaches for your marketing goal. Prioritise your focus. How should I use the experiment map? Work your way in towards your hypothesis. What are different approaches, channels that work towards he same goal? Map your marketing tactics towards a common goal. What channels can you use to gain your desired results? There are numerous ways to validate or invalidate a hypothesis. On- or off-brand testing, through a landing page, interviews, Facebook Ads, etc. 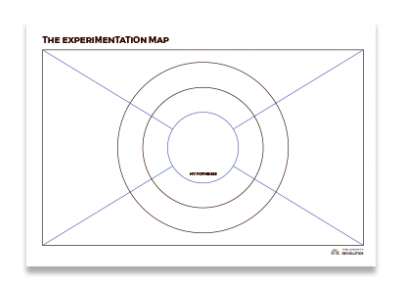 Map your road to experiment validation with the Experimentation Map.